Kobelco joins forces with Engcon and Leica Geosystems - Kobelco Construction Machinery Europe B.V.
Kobelco Construction Machinery Europe B.V. (KCME), Engcon and Leica Geosystems are proud to announce their joint collaboration in the development of a world first tiltrotator-compatible full machine control system for the Kobelco SK210LC-10 Excavator, dramatically improving on-site productivity. The system combines the latest 3D Machine Control (3DMC) technology from Leica Geosystems with the leading tiltrotator solution from Engcon, and will be first demonstrated at BAUMA 2019 before a full European launch of the system is expected in Q1 2020. The Tiltrotator attachment enables an excavator’s bucket or other power tool to tilt +/-45° and fully rotate 360°. This action improves the machine’s efficiency for a variety of working methods, increasing the productivity of the operator through the automation of difficult movements. The combination of the Leica Geosystems Machine Control iXE3 and the automated Engcon tiltrotator is a real breakthrough in automation as the operator can easily adjust the bucket in any rotated position to the construction surface, without being influenced by the inclination of the machine body. 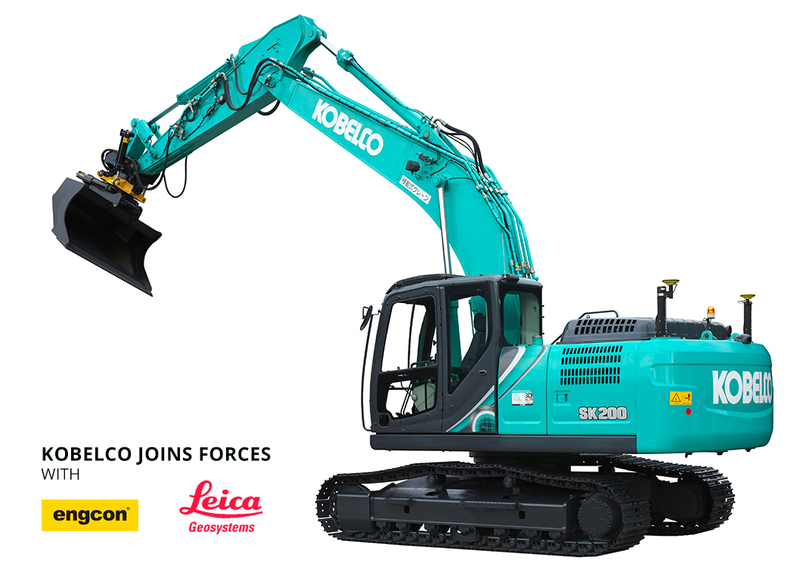 The Kobelco-Leica Geosystems-Engcon collaboration is expected to result in the World’s First system to control boom movement up and down, bucket angle, tilt angle and rotation angle precisely to the construction surface with just one single movement of the control lever. The ability of the system to automate the movement of the tiltrotator will improve efficiency of any activity on the jobsite, enabling the operator to perform complicated tasks proficiently without the need to learn how to control the system manually. This solution is completely flexible, allowing the operator to choose between Auto Boom Control, Auto Bucket Control, Auto Tilt Control and Auto Rotation Control, or a combination of all as required to give the operator maximum control. The whole system is exclusively and jointly engineered with Kobelco, Engcon and Leica Geosystems for the Kobelco SK210LC-10. Following launch of the system, Kobelco will provide a specially designed hydraulic valve system (optional item) for the SK210LC-10 through authorised Kobelco dealerships in Europe for the Leica Geosystems iXE2 and iXE3 solutions. This will work perfectly with the Engcon tiltrotator EC226. Leica Geosystems direct sales or dealership channels throughout Europe will distribute and install the Leica iXE2 and iXE3 machine control solutions for the Kobelco SK210LC-10, which can be perfectly calibrated with the Engcon Tiltrotator. Customers purchasing the Kobelco SK210LC-10 through authorised Kobelco dealerships can option the full MC package, which can then be installed in each local market through the Leica Geosystems and Engcon channels. Please visit KCME on stand FN.1016 at BAUMA 2019 to find out more about the Kobelco-Engcon-Leica Geosystems collaboration and to see the system demonstration.